The activity of all living things is caused by one thing: relationships. We have relationships with food, so we eat it, we have relationship with our clothes, so we wear them, we have relationships with people, so we love them and move towards them. From a mindspace perspective, relationships cause all organizational interactions. Let’s visualize it: people are circles and the means by which they communicate and share information are represented by lines. 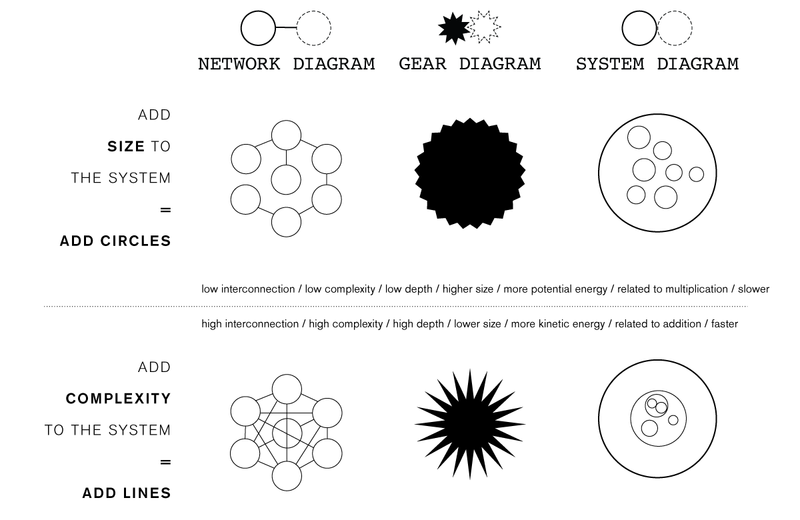 By nature, any network of relationships, such as a family or business, contains an amount of complexity, and it grows increasingly complex if the growth of new pathways (lines) outpaces the growth of new organizations (circles). When there are more lines, there is more ‘complexity’. The benefit of increasing complexity is that the entire organization feels like it’s moving faster. The problem with increasing complexity is that the organization increases in uncertainty which leads to a higher probability of collisions. It’s important to note that every arrangement of matter can be referenced as a line-to-circle ratio called complexity that crosses into an abstract space. In thought theory, it is hypothesized that an organization’s flux in complexity causes changes in the passage of time. In effect, the networks are exchanging time between themselves! Material arrangements that take advantage of complex networks prosper and reproduce, while other organisms go extinct because they have been out-paced by these more successful time-dilated organisms. Complex networks rise to glory and go extinct, as their networks grow and sustain large resources of time. All symbols in mindspace distort time and space (not just the living minds).